Hey guys! Happy hump day! This week is surprisingly going by fast, which is good because it's the last week of classes! I have a big presentation tomorrow and one final next week and then I'm DONE. Done for a whole month! Then I gotta do it all over again come January. Boo. I'm just excited to have a little break! Today I just wanted to share with you guys a few photos from Thanksgiving. I took a few family photos for my brother and sis and their families, aren't they just the cutest? Being an aunt is probably the funnest thing ever, I just love those kids to death. 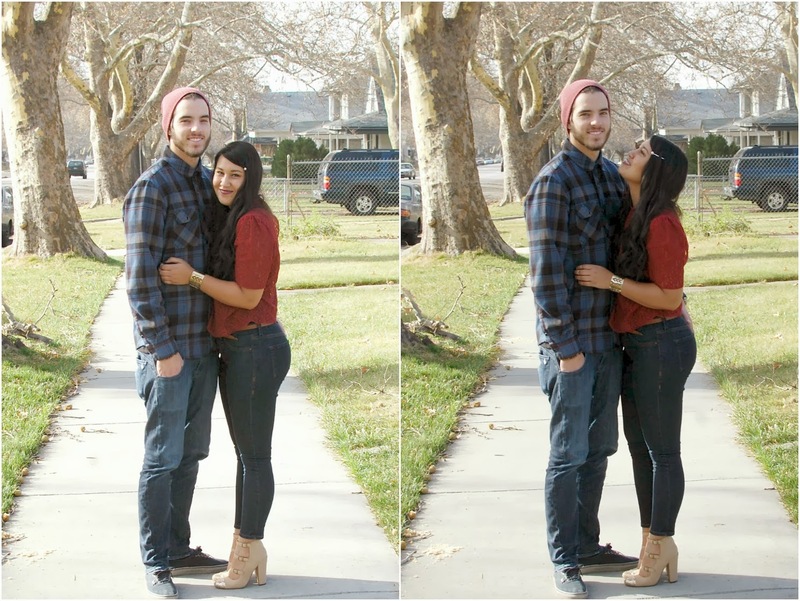 Thanksgiving was seriously so much fun. We did my family's dinner first, which included some delicious Redd's Apple Ale (seriously so yum) and enjoying some old family home videos. I just got such a kick out of seeing myself as a kid and hearing my tiny, raspy voice. I was so cute! Haha. Then we finished off our Thanksgiving at Taylor's family's house with a delicious fried turkey and the most amazing sweet potatoes! Seriously, my belly was so full I thought I was going to explode. So. Much. Goodness. I can't believe that was already almost a week ago! But now Christmas is approaching FAST and I couldn't be more excited about it! This last weekend was full of Christmas activities--putting up the tree, putting up our outside Christmas lights, decorating the house, wrapping presents, buying presents... (did you guys do lots of shopping?!) so it's safe to say it was pretty much the best weekend. This year we didn't do any Black Friday shopping, but I did support some small shops on Small Business Saturday, and got A TON of good deals on Cyber Monday. I'm completely done with my husband already and he is definitely getting SO spoiled this year. I was even smart and got all his gifts delivered to my mom's house. Score. Anyway, on to the fun stuff! Today marks the fourth day of Christmas and we have another fun giveaway for you today! Before we get into details, you can read about the two featured bloggers for today below! Remember you can still enter for the other day's giveaways as well! We are teaming up with Collectively Yours boutique to offer you a piece from their collection. Collectively Yours was started by Breanne Miller in 2012 as a way to earn some extra cash for a family trip. Her small goal turned into a love for modest, stylish, affordable fashion. She also uses her boutique as a way to inspire women to go for their dreams. To break the molds, step out of our comfort zones, and see what we as women can accomplish! 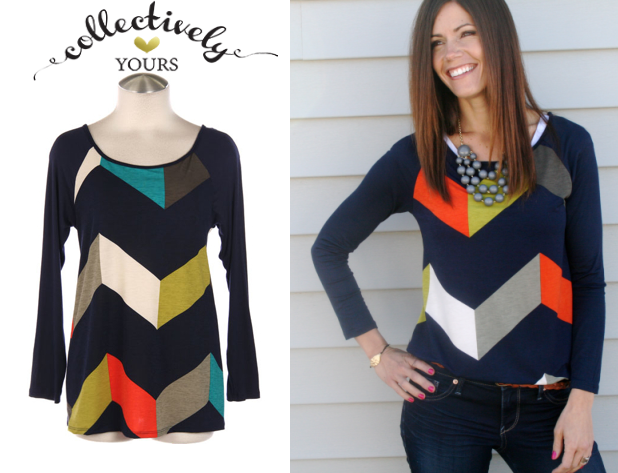 One lucky winner will receive this cute colorblock chevron top! Enter below using Rafflecopter. I love that video you put on Instagram. You had the cutest little kid voice :)! I love the geometic sweatshirt they have. It's quite lovely. My favorite piece is the High Collar Coat. I love all of the printed leggings they have!